The High Line - a section of track between roughly MP 469 and MP 471 on the Silverton Branch of the San Juan Extension - is probably the most famous and spectacular section of the route. This rugged section has the track perched on a ledge carved from solid rock, nearly 400 feet above the Animas River below. The High Line was constructed during the winter of 1881-1882, using workmen lowered over the rim of the canyon on ropes to drill and blast. The cost was reportedly as high as $1000/ft in some places. 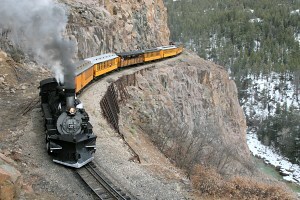 Today, trains of the Durango & Silverton still pass over the High Line on their way to and from Silverton, CO. The High Line section ends in a spectacular 130 foot, iron pin-connected deck truss bridge, crossing from the west to the east side of the Animas River as you travel north (timetable west). This bridge has become known as the "High Bridge", as it is the highest on the line. The original structure built in 1881-1882 was a wooden deck truss, but this was replaced in 1894 with the iron structure there today. The only major change to the bridge came in 1981, when the Durango & Silverton had it strengthened to be able to support the weight of K-36 and K-37 class locomotives. This change largely consisted of having extra tension members added in parallel with the existing ones, and the cosmetic effect on the bridge is minor.